Vet Acup College | What is Acupuncture? Home > What is Acupuncture? Acupuncture is the insertion of very fine needles into specific points on the body, which have the ability to alter various body functions to produce homeostasis. Acupuncture points differ from the surrounding skin, having a higher concentration of nerve bundles, blood vessels and lymphatics. Stimulating these points causes the release of many neurotransmitters and hormones, which in turn regulate the blood flow, normalise autonomic function and relieve pain. Each acupuncture point has a number of specific actions and a combination of points is selected to treat particular clinical conditions. Acupuncture points may also be stimulated by many other methods points, e.g. acupressure, moxibustion, electro stimulation, gold beads, aquapuncture and laser. Veterinary acupuncture has a long history that is closely associated with human acupuncture and has been practised for about 4500 years. The first known veterinary texts and charts (650BC) related only to horses. Descriptions for cattle, pigs, camels, chickens, ducks, geese, sheep and goats were published much later. Most of our knowledge of dogs and cats has been transposed from human texts. Today veterinary acupuncture is used all over the world, either alone or in conjunction with western veterinary medicine or surgery. 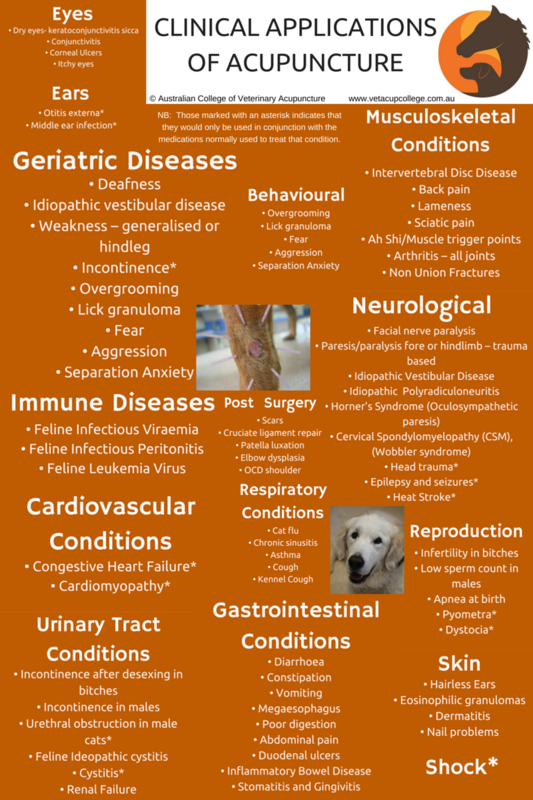 Clinical research has shown positive results in the treatment of both animals and humans for a variety of conditions. Acupuncture may be used either as a sole treatment or as an adjunct to conventional western management of a variety of conditions: musculoskeletal, dermatologic, urinary, respiratory, cardiovascular, neurological, gastrointestinal, behavioural, reproductive, ocular, aural and geriatric. Because it restores homeostasis it can also be used as a preventative treatment to keep athletic or working animals in top physical condition. Scientific studies have shown an increase in endorphins, an increase in red and white cell counts and an increase in cortisol levels in the blood stream after an acupuncture treatment. Acupuncture also relieves muscle spasms, stimulates nerve regeneration and stimulates the body’s defence mechanisms. Recently the use of MRI to study the changes in the brain during acupuncture has shown that stimulation of acupuncture points results in specific changes in the central nervous system. For example, acupuncture points that have pain relieving properties tend to activate specific pain-association areas in the brainstem. These studies have shown that changes in the brain depend on the point selected, the method of stimulation and the duration of stimulation. This correlates with the traditional use of acupuncture points and stimulation methods. Clinical evidence shows that acupuncture affects all major physiological systems of the body. It can be used alone or in conjunction with mainstream medicine and surgery, to achieve better patient outcomes. Although many physiological effects of acupuncture have been studied, there are many that have not been explained and continuing research is important for a better understanding of its effects and its proper use in veterinary medicine. For small animals, the insertion of acupuncture needles is virtually painless. A skilful practitioner inserting a needle causes only a slight pricking sensation which is less painful than the cutting action of a hypodermic needle. Once the needles are in place, there should be no pain. Most animals become very relaxed and even sleepy during the treatment. People describe sensations such as tingles, cramps, or numbness which occur when the needles are stimulated, presumably these also occur in some animals. Acupuncture is one of the safest forms of medical treatment for animals when it is administered by a properly trained veterinarian. Side effects of acupuncture are rare e.g. an animal’s condition may seem worse for up to 48 hours after a treatment. Other animals may become lethargic or sleepy for 24 hours. These effects are an indication that some physiological changes are occurring and are usually followed by an improvement in the animal’s condition.